Green buildings are the wave of the future. And our local schools are catching that wave with students from Arcata and McKinleyville high schools Humboldt Regional Occupational Program building trades construction class involved in the planning, design and every phase of the building process of a just-completed green home in McKinleyville. The kids and their instructors invite you to join them at an open house this weekend in a celebration of the completion of a two-year construction project -- Friday, Oct. 12, 1 to 6 p.m. and Saturday, Oct. 13, 9 a.m. to 5 p.m. at 1245 Chelsea Way McKinleyville. For more information, contact instructor Dave Enos at (707) 498-3438. Details on the Craftsman-style house were provided by Enos. The roof-mounted, 12-panel solar array is rated at 2.33kW and should generate over 10kW of power each day. The system uses Emphases Micro Inverters to convert the DC power to AC power. The system should generate enough electricity to meet the majority of the home's electrical energy needs. The system can be monitored on site and on-line to determine the energy production of the system at any given time. The heat recovery ventilator is designed to replace indoor air with fresh, outdoor air on a 24/7 schedule. The attic location of the HRV unit allows the ducting to pull in outside air from the west side of the home and to bring the fresh air into the three bedrooms and family room and to pull the exhaust air from the kitchen and two bathrooms. The exhaust air pre-heats the fresh, incoming air and recaptures 80% of the heat energy from the exhaust air. The system is designed to completely replace all of the home's air with fresh air once every three hours. Air-tight homes need to be mechanically ventilated to provide fresh, healthy air for the home's occupants. All the kitchen appliances are LG brand. The microwave doubles as a ventilation fan and exhausts air to the outside. The all-stainless steel dishwasher is one of the quietest on the market and is Energy Star rated. The electric range is one of LG's nicer units and comes with self-cleaning and convection oven capabilities. The electric range option was taken in order to utilize the solar PV system's potential. The majority of windows in this home are located on the south and west sides of the house. The first-story concrete slab and slate are heat absorbing surfaces, designed to assist in heating the home. The design uses daytime natural lighting to minimize the lighting energy needs. Exterior wall cavities are a full 6" thick and filled with Ultrafit-DS fiberglass blown-in insulation. All wall cavities have been sealed between the studs and exterior sheathing, reducing air infiltration. Half-inch closed cell insulation strips were placed between the interior stud wall and the interior drywall on the house's exterior walls. This thermal-break lessens the heat loss created by conduction through the studs and the drywall. The second story floor is insulated on the lower side of the floor joists. This insulation provides an oven-effect for the upper floor hydronic in-floor heat system as well as a sound barrier between floors. The blown-in attic insulation has an R-38 rating. Each room is insulated between common walls to reduce sound transmission. The first-story, 5" thick slab is insulated with 2" rigid foam. The slab is protected from moisture infiltration by a 15 mil vapor barrier. The house was built using Anderson windows and sliding glass doors which are vinyl, dual-paned glass. The windows and doors are Energy Star rated. The Anderson manufacturing company uses recycled materials to build the frames for their window and door products. The home has been designed to surpass the California Title 24 energy efficiency standards by more than 40%. 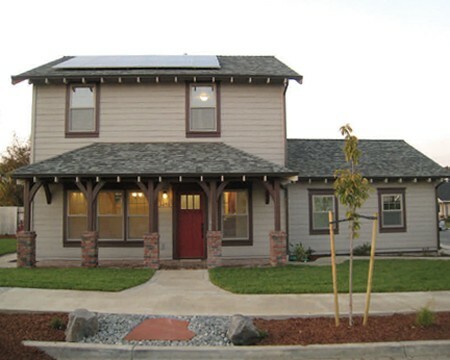 This high efficiency rating qualifies the home for the PG&E Solar Homes Partnership Program. A small number of homes are able to qualify for this program due to difficulty of reaching the efficiency standards. The house lighting is either light emitting diode (LED) or compact fluorescent (CFL). This lighting requires a very low energy demand and will greatly reduce the replacement interval. The interior electric sub-panel is located in the mechanical closet allowing circuit breakers to be readily accessible. The short circuit line lengths reduce wire-length runs and materials used. Each room has multiple phone and cable connection points for the Cat and coax cables. A structured media center hub is located in the garage. This centralized media center allows for all of the home's present and future communication needs to be upgraded from one convenient location. The ceiling fan is designed to keep the air moving and assist in relocating the heated air throughout the house. The refrigerator wall area has a smart-wire connection port to be used with a Smart Fridge. The home was painted with Green Label, low-VOC paint. The carpet is 100% BCF Polyester. The carpet pad is approved by the Green Building Council and exceeds the CRI indoor air quality standards. Cabinets were built with solid cherry wood and plywood and contain no formaldehyde off-gassing products. The home is heated with a 96% efficient natural gas condensing hot water heater. The hydronic heating system creates no dust and uses the natural convection properties of warmed air to circulate heat. PEX tubing and individual room thermostats allow for heat to be delivered to only the rooms requesting heat. The plumbing/ electrical mechanical closet is centrally located in the home, allowing for short plumbing runs. Low-flow water fixtures were used to minimize water and energy usage. Short plumbing runs allow for lower energy usage and less water consumption when transferring heated water.